I love watching National Geographic Channel. I've seen Dr. Brady Barr's Dangerous Encounters series where he went on a mission to be the first man to catch all 23 known species of crocodiles in the world. Dr Barr travelled to The Philippines to catch the endemic freshwater crocodile (scientific name: Crocodylus Mindorensis) first sighted in Mindoro, reported to be extinct, but later re-discovered in the mountains of Luzon particularly in Isabela province where it's locally known as "bukarot." Last February 2006, my friends and I travelled to Palawan for a long-delayed and much deserved vacation touching down first to clean and green city of Puerto Princesa. 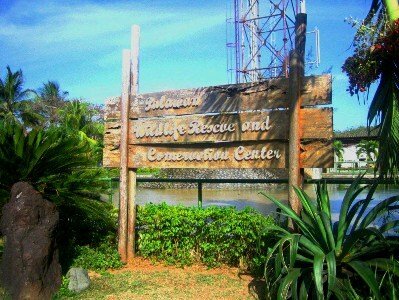 The initial half-day city tour included a visit to the Crocodile Farming Institute (CFI) now part of Palawan Wildlife Rescue and Conservation Center (PWRCC). 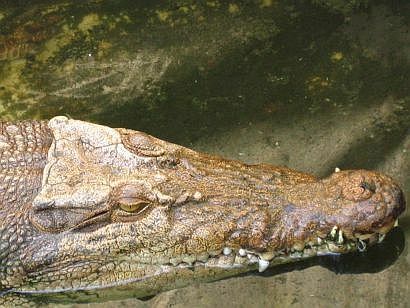 The CFI is tasked with the difficult undertaking of saving the endemic freshwater crocodile as well as another species of saltwater crocodile that can be found here and other southeast Asian islands. A tour around CFI included a video presentation of the world of Crocodilians, a guided tour of the facility and display of the preserved skin and bones of "Rio," the largest saltwater crocodile caught in the Philippines measuring 17 feet and six inches. 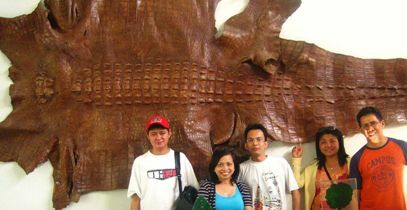 While the "bukarot" is the most critically endangered crocodile species in the world, our guide seemed to be ignorant of the third or so species of the crocodile here -- Crocodylus Politicus -- whose habitat include Malacanang, Batasan, Senate, City/Municipal halls, and other government offices. 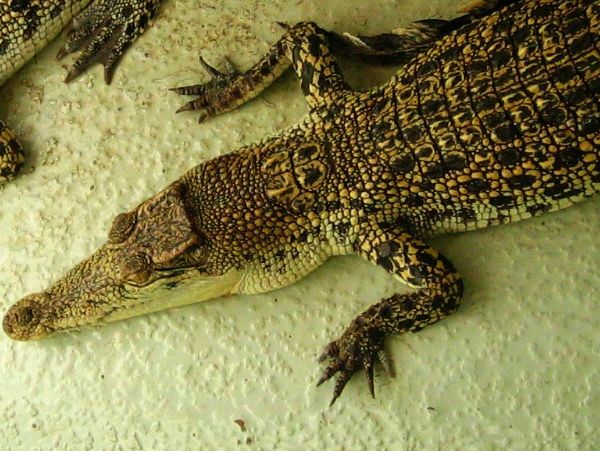 Crocs change skin after 3 years; Crocodylus Politicus do just the same in time for the second Monday of May every three years. Crocs are very powerful but such power is only available in very short bursts; Crocodylus Politicus' power turn into delusions thinking they're above the law or they themselves are the law! Crocs are so voracious they can devour a prey in a matter of minutes; Crocodylus Politicus devour their hapless prey -- ordinary citizens -- lasting an agonizing lifetime of hardships. 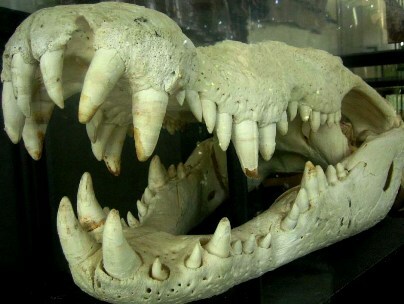 Crocs skin is hard, tough and armor-like; Crocodylus Politicus' skin is similarly "makapal." Crocs, according to historical accounts, used to inhabit most parts of the country including Laguna de Bay but now critically endangered; Crocodylus Politicus seem to multiply exponentially making the political and economic situation of the country much worse. These traits of Crocodylus Politicus seem to be also tightly embedded in the genes of their offsprings resulting to what is called a dynasty. 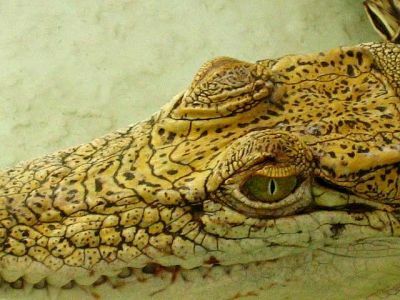 I openly advocate conservation and protection of our country's rich biodiversity, said to be the most diverse in the world, but I'm also batting, somewhat ironically, for the outright extermination of the Crocodylus Politicus species in our society. But as long as most people remain poor and ignorant, they will always be held captive by the powerful jaws and sharp teeth of Crocodylus Politicus. No longer can I endure seeing my country suffer because of their greed and lust for power! Copyright 2006 Tutubi. All rights reserved. This material may not be published, broadcast, rewritten or redistributed. All pictures taken using Canon Ixus 30, cropping/resizing and contrast/brightness adjustments only. Tito, you're really a good photojournalist! I suggest you start contributing your photos & writeups to the Phil. Daily Inquirer - may travel section naman sila! I hope you're talent will be more utilized and appreciated! Hi, my name is Caren Carlos! I came across your blog from the PhPhoto yahoogroup. This is a really interesting entry. It's interesting how you were able to get those close-up photos of the crocodiles. The firm I work for recently designed the official Philippine Crocodile website. You might want to check it out, although it's not 100% finished. By the way, teary eyed ako while reading this article and reminiscing our Palawan travel. Also, I would like to suggest to include the pictures of the baby crocodiles you took. Ops, sorry for the typographical error on my earlier message - should be "your" talent and not you're talent. Hi This is Pierre from France. Seen from here, your reportage is captivating, Tito. Crocodiles are exotic creatures to us… There's a conservation attitude in Europe that goes by itself but still, I'm astonished by the thousand of men, even conscious men, who, every week-end, take guns and go shooting… little birds. With no justification but blind violence. But that's another story… Wait for me in Palawan. best. Titobi, your literary style really deserves to be read with a wide coverage, I am hoping that in the near future I'll be seeing your column in a national broadsheet. Carry on bro...ang luufffeettt mo talaga. Your photos are clear and well-composed, and I like the lighthearted style of writing. I'm a fan of Dr. Brady Barr myself. One of my desktop images is Super Croc from National Geographic. I envy you for having made those photos, because my pictures of (stuffed) crocodiles were made inside a museum. Just a small suggestion. We need not equate crocodiles with politicians anymore. I have some thoughts about this practice in http://megamouth.elizaga.net/11/opinion.html.